April 22 HAPPY EARTH DAY – Deal a Day for Earth Day – 25% off Tagua Half Slice & Hanging Half Slice Earrings! TODAY’S HAPPY EARTH DAY DEAL: 25% off our beautiful Tagua Disc & Hanging Half Slice Earrings! These colorful and playful earrings are made from three hand carved tagua pieces. Mix and match with our slice or chip style bracelets or the matching carved tagua disc bracelet and necklace. Each pair of earrings is made from three hand-cut slices of Tagua nut and they come in brown, purple and turquoise. April 21 – Deal a Day for Earth Day – 25% off Tagua Half Slice & Hanging Half Slice Necklaces! TODAY’S DEAL: 25% off our Tagua Half Slice & Hanging Half Slice Necklaces! Each pendant is made from slices of Tagua nuts, carefully selected to showcase the natural essence of each unique piece. 100% handmade from tagua nut with a cotton cord. Also available in Brown. 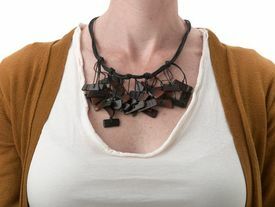 This stylish necklace is a composition of thinly sliced tagua nuts, carefully selected to showcase the natural essence of each unique piece. This beautiful and stylish piece is intertwined together with cotton strings. 100% handmade from tagua nut. April 20 – Deal a Day for Earth Day – 25% off Half Round & Disc Tagua Necklaces! TODAY’S DEAL: 25% off our beautiful Tagua Half Round Necklace & Tagua Disc Necklace! 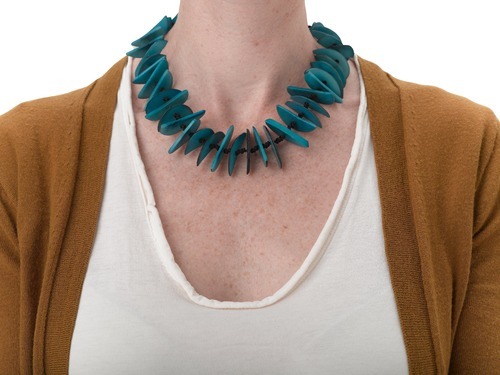 Tagua Half Round Necklace has alternating colors of half-round pieces of Tagua come together on an adjustable silk cord. The Hope For Women flower logo adorns the chicon Tagua at the closure. The Tagua Disc necklace is an array of colorful and playful necklace is made from varying sizes of hand carved tagua pieces. Mix and match with our slice or chip style bracelets or the matching carved Tagua disc bracelet and earrings.